Get Your Diagnostic Imaging Equipment Accredited Today! 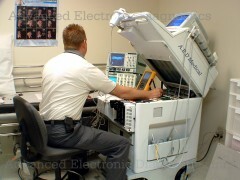 In order to be Accredited, your Ultrasound Equipment needs to have a contract which provides two Qualified Periodic Maintenance (PM) services perform each year. The PM is your friend! By having this regular preventative review of your equipment, you can be assured that there will be no unforseen losses of productivity time due to equipment which is not in operable condition. Our qualified engineers will perform a comprehensive PM on your machine to ensure that all equipment is in safe condition by examining all exterior surfaces for defects, ensuring that no voltage leaks can be detected anywhere throughout the system, all probes are imaging correctly, filters are clean, and more! Our comprehensive Accreditation PM covers more than 25 critical points needed to ensure top performance of your device. Should problems arise with your Accredited device, our skilled engineers will work with you to correct the issues on a timely basis, and provide discounted parts and labor for major repairs.